The life of a business owner looks so dreamy sometimes, doesn’t it? Coffee dates, lunch meetings, flexible schedules…..
All of those things do happen on occasion, yet there are many tricky moments too! 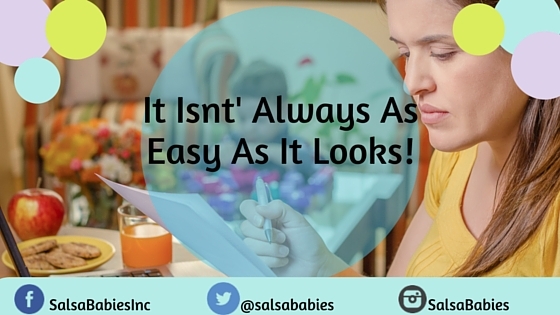 Many people look at Salsa Babies and think ” I can do that” or ” I can make my own company just like that” and so they set off to enter this world…. What they fail to see the hundreds of hours of planning and analysis that goes into a company like this. Don’t forget about the tens of thousands of dollars in branding, training materials, research, and other essential added-value that we choose to provide to our instructors and participants. Looks simple enough, but it is a LOT of time and money involved to do it correctly! When I took over this company, I was blown away by all of the “other” things involved with this business. Learning about: what makes a quality garment, screen printing, vinyl transfers, behind the scenes of website design, coding, hackers (ugh!! ), websites going down, website launches, finding solid partners to support you ( and not just those that want to tag along for the ride! ), the vast dynamics of personalities, schmoozing (!! ), software, Conference planning, hardware, taxes, advertising (oh my!! ), social media, law…..ahhhhh!!!! And all while being the visionary and leader to take this company where we and our instructors know it is destined to be! This has certainly been the biggest challenge of my life ( while still putting my kids on and off the bus each day! ), but I have also learned so much about so many things I didn’t know, that I needed to know!! While I certainly believe in innovation and new business, there is also something to be said for choosing the quality path and not having to “re-invent the wheel”!! !